Good morning! This post has three parts ... probably because I'm lazy and don't want to make three posts AND I often forget where the actual pause button in my brain is! The first part - the giveaway. This is the first time I've done this so be gentle with me! When I was a kid (137 years ago) there was a jingle on TV and the radio...and in the jingle the tag line was "It's TWO, TWO, TWO ______'s in one!" So to be entered in the giveaway just tell me what the missing word is. Now if you are not 137 years old or your Mom never let you watch TV you can click here for a clue if you're totally stumped. Just tell me in a comment below what the missing word is and you will be entered to win. Get a second entry by becoming a follower of my blog. Are you confused? I am. But I'm allowed cuz this is my first time being the "give-or" AND I suspect you might have signed up to be the "give-ee" before! So close your eyes and see what word completes this jingle..."It's two, two, two ___'s in one!" Actually that didn't work super well because you couldn't read it with your eyes closed! Darn, I hate when logic flees from my brain "as dry leaves that before the wild hurricane fly." OK, so let's see....ummmm... I will pick a winner on Saturday morning from the potential "give-ee's" and you will receive a moderately kind of cute Autumnal prize! Actually I like the prize very much and if I didn't already have some iI would keep them! I was crafty again today. Lazy crafty actually but I'm mighty pleased with the results so I thought I would share the idea. I had planned to go to Joanne Fabrics and get some stuff to start making Christmas cards but I didn't. I was lazy. However, I did find a little stash of paint chip card thing-y's from Home Depot and voila! Look how cute they are!!! I have decided I am going to make all my Christmas cards with recycled stuff I have in my craft closet. Heaven knows there is a ton of stuff in there. I just sliced off the little word part with my handy-dandy paper cutter, picked some contrasting papers, stamped Joy in each little box and I think they actually turned out pretty darned cute. But these aren't the giveaway. You might think they are because there are three of them. But no. You will have to wait to see what the prize is. So there. And last but not least Red Writing is doing a little 12 Weeks of Christmas motivational thing and I'm trying to follow along because I think her blog is cute AND I'm trying to be extra-festive this year. And she is doing a giveaway, too, and certainly much more "give-or" experienced so go there for sure to enter hers as well. When the fire is burning low, the gift paper has been crumpled away, and the last Christmas cookie devoured, I sit with a quiet cup of tea and write a Christmas letter to myself. I remember the day and the people and the food and the favorites and then I tuck the letter away into my stocking so I can remember...next year and the year after that and the year after that. And every year when I dust off the boxes of Christmas decorations and unpack the stockings I make myself a cup of fragrant tea and take a little trip down memory lane with all the saved letters I have. 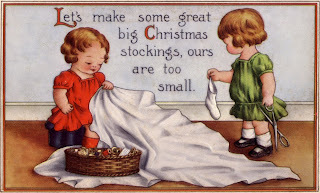 And I hope that someday my childrens children will sit around their fire as it is burning low and write about their holiday memories and add them to the stack of stored letters in their Great-Grandma Jenny's tattered and worn stocking. And if this is not a seriously ADD blog post I don't know what is. But don't be a hater. Just go along with the whole confusing mess. Oh, Jen. I love the letters to myself idea. I am going to start it this year. I think it is two, two, two mints in one! LOVE your Christmas letter idea. I think I am going to have to start doing this. How neat...is the ad for certs? Two, two, two tastes in one???? Ok, I freely admit I pay no attention to ads (unless it contains Lousie the lizard et al!) But would still love to be in your pick. After all... I was in Britain till April 2007! Bummer! Ok, after a very large HINT it's Certs! Two mints in one!TY Jenny! I love the cards, greta idea recycling! I love it!!!! Okay, don't go to JoAnn's, wait for next weeks box. KK?? Your letter to yourself is such a great idea. I'm to old for it to have time to build up a cluster of letters, but maybe my kids and grandkids should start doing it this year! I'm guessing mints from your hint :) Though reading all the other comments, they make sense too! Thank you for visiting my site earlier! By the way, love that song you have here: Over the Rainbow. I'm a new follower too! The answer is "Mints". I still had to look at the clue. I knew, I knew the answer, just couldn't remember it. I loved "certs" when I was a teenager. I am signing up as a follower. Now on to your TWOC post, I loved it. The Christmas letter to yourself is a fabulous idea. Why didn't I think of it? I hope your kids appreciate them some day. I like the confusing mess...It is fun to read! the answer is two mints in one......Love the cards too and I think using what you have makes you more creative! love the cards!!! I'm at least 150 years old and I remember...two mints in one! I like those pretty and quick Christmas cards! I've used paint chips in the past, they make cute add ons. Your Christmas tradition is so lovely. So mamy sweet little things can be forgotten so keeping a letter journal like that is such a nice idea. I love looking back at all the letters and cards I've saved over the years...I have a giant box full! Hop over to my place and bring a fav dessert (can be one in your archive). Cute idea for the card with paint cards!!! Love it. And your gum cover craft is still baffling me--I AM going to make one.. Writing the letter is a fantastic idea. Those letters will be SO cherished one day! Something really scary on Halloween! 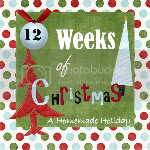 12 Weeks of Christmas - All about the food! Grandpa and Granddaughters have a Crafter-noon! Don't worry, it's not another recipe post! Hey! Do you want to make a cool FREE craft?